Srinagar is the largest city and the summer capital of the Indian state of Jammu and Kashmir.The city is famous for its gardens, waterfronts and houseboats. It is also known for traditional Kashmiri handicrafts and dried fruits. Srinagar is one of several places that have been called the "Venice of the East" or the "Kashmiri Venice Lakes around the city include Dal Lake – noted for its houseboats and Nigeen Lake. Apart from Dal lake and Nigeen lake city is also famous for wular lake and manasbal lake to the north of srinagar. Wular lake is one of the largest fresh water lakes in Asia. Srinagar has some Mughal gardens, forming a part of those laid by the Mughal emperors across the Indian subcontinent. The Indian government has included these gardens under "Mughal Gardens of Jammu and Kashmir" in the tentative list for sites to be included in world Heritage sites. The Shankaracharya Temple which lies on a hill top in the middle of the city, besides the Kheer Bhawani Temple are important Hindu temples in the city..
Mughal gardens are a group of gardens built by the Mughals in the Persian style of architecture (Nishat, Shalimar, Chashma shahi garden) This style was heavily influenced by the Persian gardens particularly the Charbagh structure. Significant use of rectilinear layouts are made within the walled enclosures. Some of the typical features include pools, fountains and canals inside the gardens.he founder of the Mughal empire, Babur, described his favourite type of garden as a charbagh. Nishat Bagh is a terraced Mughal garden built on the eastern side of the Dal Lake, close to Srinagar in the state of Jammu and Kashmir, India. It is the second largest Mughal garden in the Kashmir Valley. Shalimar Bagh is a Mughal garden in Srinagar its right bank located on the outskirts of Srinagar city in Jammu and Kashmir. The Bagh was built by Mughal Emperor Jahangir for his wife Noor Jahan, in 1619. The Bagh is considered the high point of Mughal horticulture. It is now a public park its a largest Mugal garden in srinagar which is bulid by mugals. Chashme Shahi or Chashma i Shahi (translation: the royal spring), also called Chashma Shahi its near by other mughal gardens Chashma Shahi is one of the Mughal gardens built in 1632 AD around a spring by Ali Mardan Khan, a governor of Mughal emperor Shah Jahan as per the orders of the Emperor, as a gift for his elder son Prince Dara Shikoh. The garden is located in the Zabarwan Range, near Raj Bhawan (Governor‘s house) and Pari Mahal (Fairy Palace) overlooking Dal Lake in Srinagar, Kashmir. Indira Gandhi Memorial It is the largest tulip garden in Asia spread over an area of about 30 hectares With 20 lakh tulips of 46 varieties in its lap. It is situated on the foothills of Zabarwan Range with an overview of Dal Lake. The garden was opened in 2007 with the aim to boost floriculture and tourism in Kashmir Valley. Tulip festival is an annual celebration that aims to showcase the range of flowers in the garden as a part of tourism efforts by the Government of Jammu and Kashmir. It is organized during the onset of spring season in Kashmir valley. In 2017, the Tulip Festival is celebrated in every year. 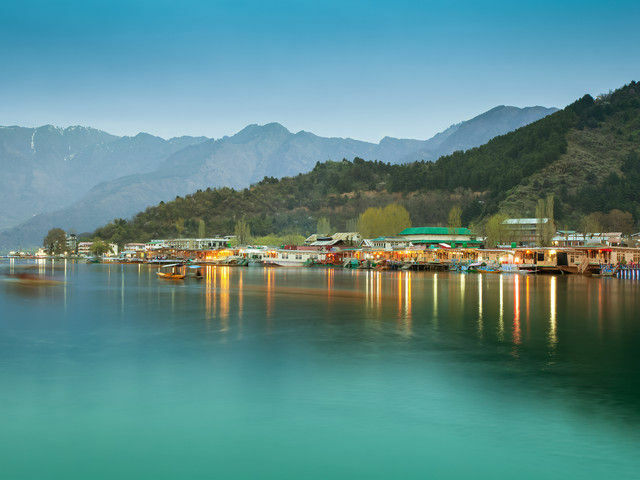 Dal is a lake in Srinagar (Dal Lake is a misnomer as Dal in Kashmiri means lake) The urban lake, which is the second largest in the state, is integral to tourism and recreation in Kashmir and is named the "Jewel in the crown of Kashmir" or "Srinagar's Jewel". The Dal Lake which has the length of 8 Km long and a width of 4 Km, spreads over a total of 26 Sq. Km. We provide free Shikara Ride in Dal Lake with our cheap Srinagar tour packages The lake is also an important source for commercial operations in fishing and water plant harvesting. Its just 14 kms Approx from Srinagar Airport. The shore line of the lake, is about 15.5 kilometres (9.6 mi), is encompassed by a boulevard lined with Mughal era gardens, parks, houseboats and hotels. Scenic views of the lake can be witnessed from the shore line Mughal gardens, such as Shalimar Bagh and Nishat Bagh built during the reign of Mughal Emperor Jahangir and from houseboats cruising along the lake in the colourful shikaras. During the winter season, the temperature sometimes reaches −11 °C (12 °F), freezing the lake then the local Peoples / Tourist can walk on it or play a cricket. The sacred Shankaracharya temple, also known as Jyeshteswara, occupies the top of the hills (about 1,000 feet (300 m) above the surrounding Takht-I-Sulaiman plains in the south-east of Srinagar. Shankracharya Temple is 10- 12 Kms from Bolevard Road and 300 Steps climb to temple. The site, initially named Gopadri, dates back to 250 BC as a Buddhist monument, probably built by Emperor Ashoka's son Jhaloka. In the 7th century it was replaced by the present temple by King Lalitaditya. The philosopher Shankaracharya is documented as having stayed at this place when he visited Kashmir ten centuries ago to revive Sanātana Dharma. Built on a high octagonal plinth (20 feet (6.1 m) high) on solid rock and approached by a flight of steps with side walls that once bore inscriptions, the main surviving shrine consists of square building with a circular cell. It overlooks the Srinagar valley and can be approached by car. A modern ceiling covers the inner sanctum and a Persian inscription traces its origin to the reign of Emperor Shah Jahan. There is also a Shiva Linga coiled by a serpent, located in a basin inside the sanctum. The original ceiling was dome-shaped and the current brick roof is said to be about a century old. Hari Parbat, also known as the Mughal fort, is a hill fort on Sharika hill that provides panoramic views of the Srinagar city and the Dal. It was first established by Mughal Emperor Akbar in 1590. However, he only erected the outer wall of the fort and his plans to build a new capital called Naga Nagor within it did not materialise. The fort in its current state was built much later in 1808 under the reign of Shuja Shah Durrani. Within the fort's precincts are temples, Muslim shrines, and a Sikh Gurudwara. To visit Hari Parbat / Akber Fort you need pass which is issued by jk toursim at TRC ( Tourist Reception Center ) Srinagar. The Hazratbal Shrine also named Hazratbal, Assar-e-Sharief or simply Dargah ShariF is a Muslim shrine situated on the left bank of the Dal and is considered to be Kashmir's holiest Muslim shrine. It contains a relic believed by many Kashmiri Muslims to be the Moi-e-Muqqadas a hair from the head of the Islamic prophet Muhammad. According to legend the relic was first brought to India by Syed Abdullah a descendant of Muhammad who left Medina and settled in Bijapur near Hyderabad in 1635. When Syed Abdullah died, his son Syed Hamid, inherited the relic. Following the Mughal conquest of the region, Syed Hamid was stripped of his family estates. Finding himself unable to care for the relic, he gave it as the most precious gift to his close Mureed and a wealthy Kashmiri businessman, Khwaja Nur-ud-Din Ishbari.. Things to do Srinagar can range from staying on the house boat to strolling in the beautiful gardens. Travellers will find many activities to do in Srinagar. As one enters Srinagar, they will be enthralled by the architecture of the houses. The wooden houses have beautifully carved balconies with humble faces peeping out. The Khanqah building of Shah Hamdan is the most stunning building in all of Srinagar. One of the top things to do in Srinagar is to stay on a house-boat. Travellers can hire a house-boat at Dal Lake and enjoy the spectacular views. These mini hotels are luxurious and they offer a stay that tourists will never forget. The house boats include a dining room, bedroom and a balcony area. It feels like home away from home. Tourists cannot miss this experience for the world. The Srinagar trip is incomplete without the house boat experience. Hire a Shikara and cruise around the lake to soak in the view of Srinagar. These rowing boats will allow travellers to have a romantic time with your partner. Tourists will also notice the floating vegetable market while you are rowing away. If one wishes to take a stroll in a garden, then choose the Shalimar Garden because it will fill your senses with love and happiness. Emperor Jahangir created this garden for his partner to enjoy the beauty of nature. One will find fountains, flowers of different colours and gorgeous trees in the Shalimar Garden. There are several things to do in Srinagar in December. If you are planning a trip towards the end of the year, travellers must eat like a local would! It is a heaven for non-vegetarians because one can find many delicious Kashmiri dishes here. Kashmiris prepare the dishes with utmost love and one will realize that, after tasting their mutton, chicken, potato, cottage cheese and spinach dishes. The cuisine is different and lavish. The Royal Springs Golf Club should be the next stop for playing golf. Travellers can learn to play golf here and enjoy the stunning views. Major tournaments take place at this beautiful club. A voyager can bring back souvenirs for their loved ones. How about shopping pashminas and baskets? There are many shops in Srinagar, where tourists will find silky and feather-light pashmina shawls. Hikking In srinagar there is two places were you can hike Shankaracharya Temple & Akber Fort (Hari Parbat) for a wonderful experience ask for guide. Being the summer capital of the state of Jammu and Kashmir, the simplest time to go to Srinagar is sometimes the summer months between March and June once the climate is that the most pleasant. The daytime temperature ne’er goes on the beyond 25 five degrees and nights is gently chilly.yet to expertise the simplest of Capitol Hill station destination with a colder climate, the simplest time is taken into account because the months between October and December. (November to Feb ) are chilly and snow bound. The minimum mercury level goes below sub zero levels and the region mostly covers receives fresh snowfall. The views of the landscape are excellent with snow covered hilly terrains.